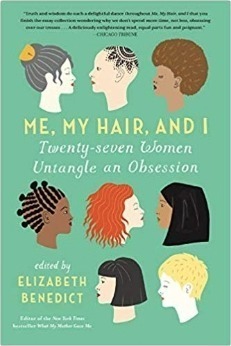 I really enjoy reading so it makes sense that I would enjoy exploring doing hair research through both word and photography. Picking up a book to do this research is so much better than browsing site after site, being distracted by one youtube video after another. I am going old school! I am also reaching out to some of the stylists in my community to research their particular methods and preferences. Here are a few that I have read recently and really enjoyed. I have online booking available now. Follow the link below to book the appointment that suits your schedule. If you are unable to find an appointment please let me know and I will do my best to accommodate your needs. Clink on the link below and it will take you to my booking site. I am currently in the process of designing a new website. This site, alittlehairhelp will remain active even after the launch of the new site. Although this site will focus on hair extension care and hair styling tips for extensions. The new site will be an information page for those clients seeking information on a consultation or an extension appointment. I can’t quite say yet when the site will be done, most likely within the next 6 months. Stay tuned for all the exciting changes! I am excited to offer a unique hair extension service regionally. Hair extensions done in the comfort of your own environment. I have so many clients who have to reschedule appointments because of personal or work plans that get in the way. I wanted to solve this problem by offering that I come to your home or office to perform a full hair extension installation and/or removal. The service would take between 2-4 hours depending on the amount of hair desired. Included in this exclusive service would be an exclusive hair extension care kit which includes a booklet of information I have compiled over the years to give you the best possible outcomes in every area of concern. Also included is a hair extension brush and a few key products that I recommend for the longevity and beauty of your hair extensions. I would just like to take a minute to say thank you to all of my clients. I love my career and it wouldn't be possible without your kindness and generosity. Every appointment you show up for, every client you refer to me propels me further towards my goals. Thank you for all the encouragement you gave me in finishing my book, Does this career make me look dumb?. I want to extend my gratitude for your patience and devotion to my industry, in exchange I give you my personal time and attention to your ongoing concerns and evolving inspiration. I have been experimenting with a scalp camera to help myself and my client's understand the particular needs of their hair and scalp. The results are still a little shaky. I am working on my micro lens skills, but I think kind of fun and beautiful. Let me know what you think. Do you want to know what your hair will look like when you don't make time to go to your stylist and you have a friend apply box color to your hair? Wonder no more. Not only will there be a band or a stripe of color where the box color was applied, there are also splotchy areas in the middle of the hair where the "friend" missed applying the color. These were just two pieces of the client's hair, but there were stripes and splotches throughout the hair. To fix this home hair color fiasco first we decided on an end result. The client wanted deep natural colored roots with ends as blonde as we could get them. The first step was to eliminate some of the splitchiness and pull any residual color out of the client's ends with Aveda enlightener and 20 volume. I applied the Enlightener using the balayage method and let it process for about 25 minutes. At the shampoo bowl I applied Aveda Demi-permenant color 7N from 1/4" away from the root to midshaft. At the root I applied Aveda men demi-permenant color 6N on the roots only to achieve a shadow root. A time lapse video of my fusion extension installation yesterday. The actual time of installation was 3 hours. I was assisted by the lovely Beatrice Sanchez. Hello I’m Jennifer Bridges. I have 12 years of experience in the salon environment. I consistently expand my knowledge in the service industry by working with a broad variety of clients and independently researching trends, customs and product lines. I am an expert in the hair extension industry and the hair color industry. I have 4 years of experience exclusively with the Aveda color line. At Blís I provide a streamlined approach to serenity. I know what makes you feel good because I listen. Blís is my safe haven, come make it yours. I am currently booking appointments in hair cut, hair color and hair extensions. Please visit my website www.aliitlehairhelp.com for further information on the cost and maintenance of hair extensions. With new hair comes a new routine. Hair extensions are an investment that must be taken care of in order to achieve the best look and to have that look last for as long as possible. All of the extensions that I install are 100% human hair, no synthetic fibers. The hair is also called Remy hair which means that the cuticle is all aligned starting at the top of the hair shaft and continuing to the bottom. Cuticle alignment is crucial for a product to stay tangle free. Products: The hair can be “treated just like your own hair” but there is a whole lot more to take care of. You can use very similar products to the ones normally used in hair but you will be looking at these products for different reasons. For example hair extensions tend to become dry over time because they don’t absorb the natural oils produced by your scalp. So moisture must be added to the extensions. The moisture can be added with moisturizing shampoo, conditioner, deep conditioning treatments, and styling products. The hair extensions don’t react well to silicone products, so they should be avoided. Most extension companies have their own lines of cleaning and styling products but I don’t think they are necessary. Through trial and error you will learn what works best in your hair. You will need an extension brush for daily maintenance. Extension brushes are typically paddle brushes with a round shape. The bristles on extension brushes can be looped which pulls the least amount on the hair, plastic bristles are also very soft and have a lot of give, boar bristled brushes provide more tension while distributing the oils through the extension hair. You can use any or all of these brushes. Tangling: Before you get the hair wet, brush through the hair with an extension brush starting at the bottom and gently working your way up the hair. To keep the extensions tangle free you will want to sleep with your hair in one or two braids. The hair should be dry before you sleep on it. When you are in the shower keep your hair smoothed down in its’ natural position. Don’t rough the hair up by lathering it or bunching it on top of your head. Your extensions will rarely need to be washed, mostly just conditioned. Your scalp is what needs to be washed. After you exit the shower blot the water out of your hair with a towel or an old t-shirt. Use the towel or cloth to gently squeeze the water out of your hair. If there is any tangling while the hair is wet be patient and wait until your hair is 90-100% dry to untangle. While blow-drying the hair keep the airflow aimed down in the proper direction of the hair. Don’t raise and rough up the hair cuticle by blow-drying in the opposite direction of growth. The extensions will add a minimum of 20 minutes to your normal getting ready routine. Styling: Most extension clients wash their hair 2-3 times per week, no more. The inconvenience of drying time combined with the loss of moisture through constant shampooing and blow drying make a good excuse for getting your hair wet as little as possible. A dry shampoo will be one of your most used products. The dry shampoo will eliminate any oil at your scalp while freshening up your extensions. Soon to come in Aveda is a dry conditioner, which will be so wonderful for adding moisture without the weight or wet styling.